"Luzes relacionais" (Relational Lights) is an interactive audio-visual installation that explores our relationship with the expressional-organic character of space. "Luzes relacionais" (Relational Lights) is an interactive audio-visual installation that explores our relationship with the expressional-organic character of space. 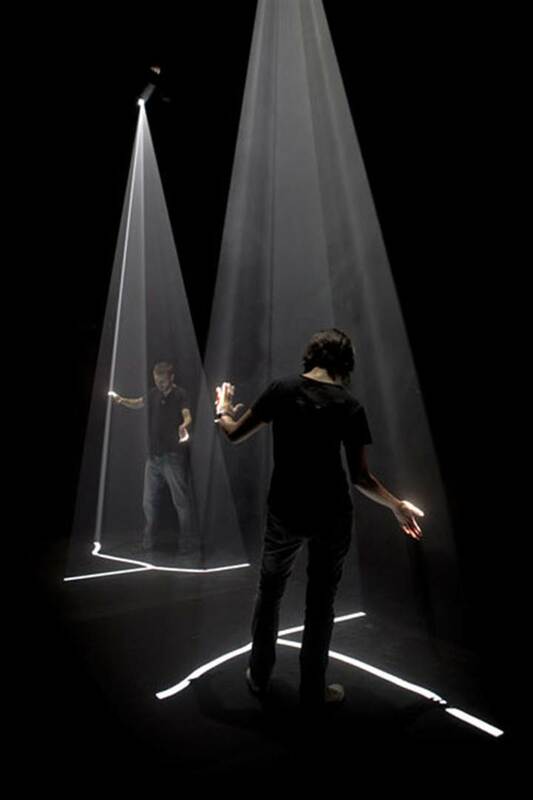 The installation uses light, sound, haze, and a custom-software system to create a morphing, three-dimensional light-space in which spectators actively participate, manipulating it with their presence and movements. The work functions as a living organism with or without the presence and interactions of spectators. When viewers step outside the projected light-space, the system begins its own dialogue with space by means of extruding and morphing sequences of geometric light forms. And when viewers penetrate and interact with the projected light-space, a collective and participatory expression of space unfolds. "Luzes relacionais" amplifies the three-dimensional fabric of space by making it visible, audible, and tangible to participants. The resulting aesthetic experience encourages an unending relational process of shaping space among participants. "Luzes relacionais" is a hommáge to the work and aesthetic inquiry of Brazilian artist Lygia Clark.